This was a fairly simple paint job; still waiting for the OG horse to arrive which will be his mount. This is one of those figures that you could say looks better in-person than in a photo. Okay, the Dixon Samurai range is justly known for its so-called "pumpkin heads." I even went so far to call them "gnome-like" in appearance on a TMP post a long time ago. However, that all said and done, I am happy with this figure (no doubt getting it free adds to the charm). He will be fine leading some OG Ashigaru and Perry Samurai in the near future. I had hoped to capture the dour look of Nagamasa as portrayed in this painting, but I think the helmet cords obscured the face a bit. This figure was given to me by Bob H. from Oregon several years ago, along with a bunch of other Dixon figures. I'm finally inspired to paint it up in anticipation of a Korean Invasion game that a few local gamers and I are working on. Nagamasa took part in the invasion and earned quite a few accolades there. 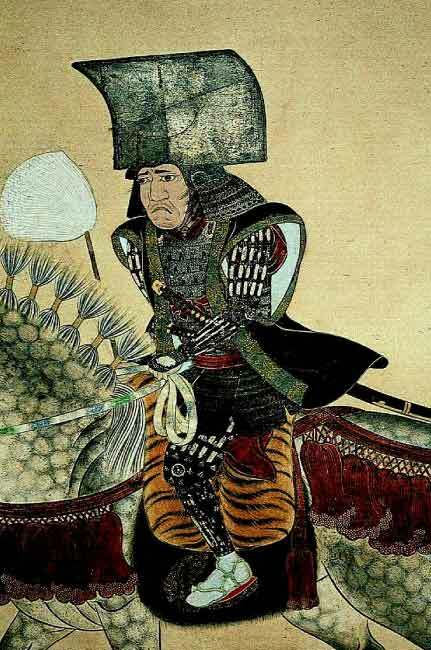 He also participated in the Battle of Sekigahara, on the side of the Tokugawa. Initially a Christian, he later became a Buddhist on Tokugawa Ieyasu's orders. The Dixon figure has Nagamsa wearing a helmet with a crest in the style called Ichi no Tani. The crest is representational of the sheer cliffs that the Minamoto warriors descended from at the Battle of Ichi no Tani. He is also known to have worn a helmet with large horns. Brass rod was used for his yari; the spear head and counterweight is from a Dixon spear. I plan to replace his horse with one of the Old Glory ones that I just won off of ebay; they have the tassels associated with Samurai horses. 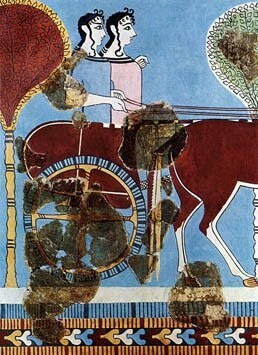 Here is the figure with the reins correctly placed; the base is also completed. Here he is compared to the 29mm Relic Antiochus the Great figure. Eventually I will have to get an Alexander the Great figure too. ERRATA: Mike Evans of Relic sent me an email & said I have the reins incorrectly added. I will need to attach the reins to the horse bit and not wrapped around the neck as it is in the photos. Now that I look at it - I'm blushing with embarrassment - even if I didn't grow up around horses, how else could you steer the horse if only choking its neck?! Sorry Mike! Still need to complete flocking the base, but figured this way the fine details on the base can be seen. 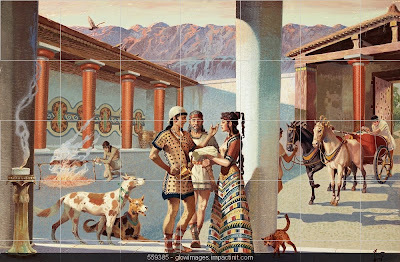 The Pyrrhus figure fits onto the horse without any problems or gaps. Mike changed this from his earlier Antiochus figure which had him molded onto a portion of the saddle. That model had a bit of a gap between rider and horse, but easily filled with putty. A minute bit of Green Stuff was used to fill the area where the rein pieces joined. A little bit more work than what I normally would prefer, but worth the effort. Hopefully, the bent pilum, broken arrows, helmet and other items can be seen. Mike Evans really went all out with this one. It is very much like a 54mm model in detals. "One of them ran forth far in advance of the rest, a man who was huge in body and resplendent in armour, and in a bold voice challenged Pyrrhus to come out, if he were still alive. This angered Pyrrhus, and wheeling round in spite of his guards, he pushed his way through them — full of wrath, smeared with blood, and with a countenance terrible to look upon, and before the Barbarian could strike dealt him such a blow on his head with his sword that, what with the might of his arm and the excellent temper of his steel, it cleaved its way down through, so that at one instant the parts of the sundered body fell to either side. This checked the Barbarians from any further advance, for they were amazed and confounded at Pyrrhus, and thought him some superior being." This is my first attempt to paint a leopard skin on 28mm. I couldn't find any tutorials online so just went ahead with a fairly easy method that hopefully looks okay. The first step was to give the skin a basecoat of a dark yellow. Any combination should work for this, as there are many different shades in real life. The edges of the skin were highlighted with white. Next, small blotches of black mixed with a little brown were added here and there on the basecoat. Finally, a dark yellow (slightly darker than the basecoat) was added within the black spots. This is actually an irregular pattern; and the black rings aren't closed. It looks okay, and only took a few minutes to do; figure once Pyrrhus is added and the rest of the horse furniture is painted it will not look too bad. The lighting is not so good, but here are some shots of Pyrrhus painted. This is an excellent figure by Relic Miniatures. Very detailed and based on the famous bust of the Eagle King. This is quite an ambitious casting for 28mm; having separate pieces for the reins among other separate pieces. Finally got around to finishing this piece. To allow its use in gaming, one wall has been left off. Still need to finish the outside - mainly plastering and painting an off white; as well as the basing itself. 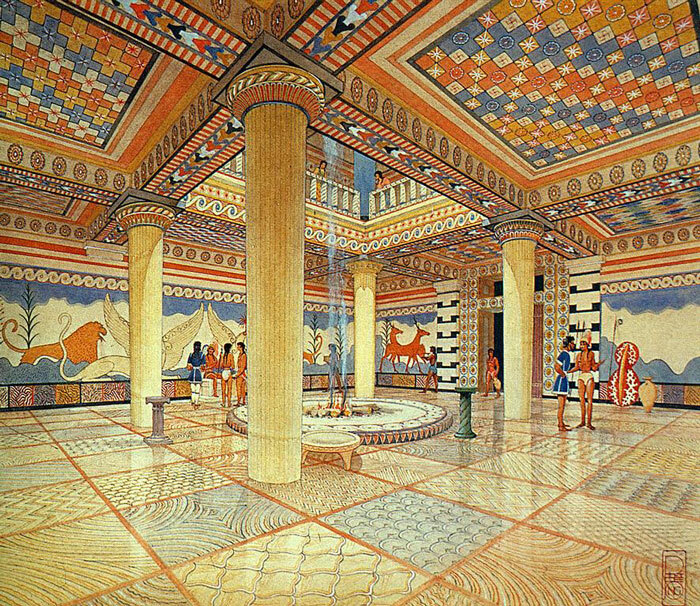 As mentioned previously, this central hall, or megaron, is based on several Mycenaean/Minoan palace ruins. 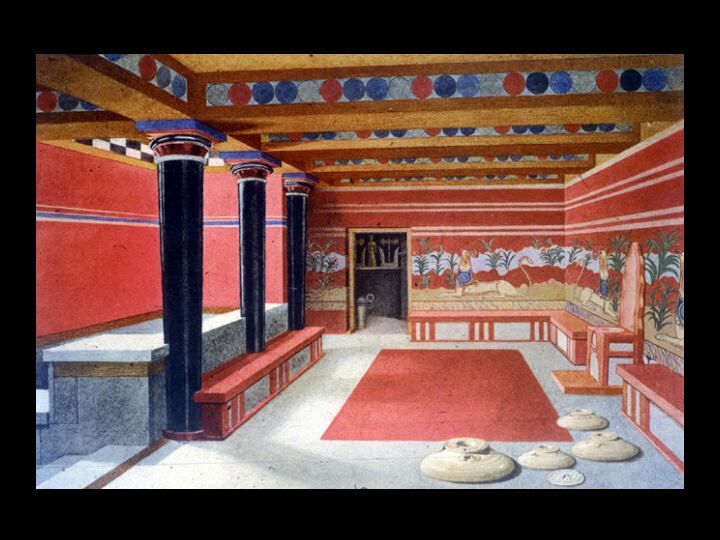 The throne and the fresco wall behind it is based on the one at Knossos. 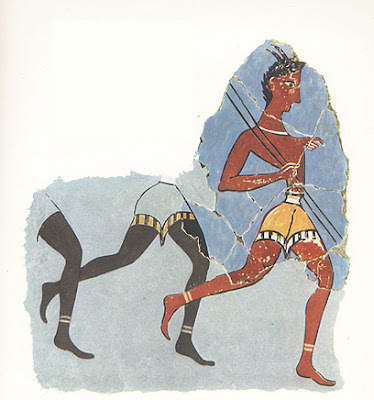 The other walls have designs based on frescoes from both Tiryns and Pylos. The hearth is based on the one at Pylos. For the hearth fire aquarium rocks were used. The areas around the rocks were given a wash of red, highlighted with yellow to represent flames. The rocks were then drybrushed gray to represent ashen coals. The throne was made from styrene plastic. Slowly working on this piece as I'm still a little tired, or satisfied, from Enfilade! a couple of weekends ago. I finished another wall; the east wall. I think I'll leave off the north wall so the area can be accessible for gaming. I used a top of a plastic container for the hearth. The hearth at Pylos is 3 meters in diameter. This one is probably a little smaller, but close enough and I want to be able to move figures around the room. Here are a couple of pictures of the work so far - with a Redoubt figure for size comparison. Still need to paint the west wall with the entrance into the room - as well as the floor and hearth. The frescoes are an amalgamation from several palaces. The one below - popularly believed to be the goddesses Hera and Athena is from Tiryns. 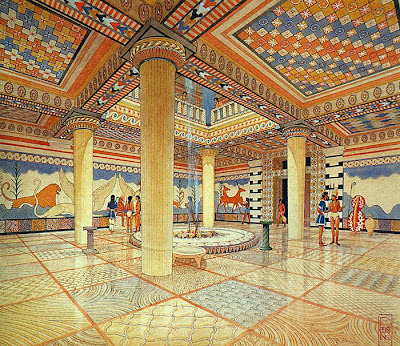 The next image of running warriors is from Knossos on Crete; and again an artist's rendition of what the place there may have looked like. The illustration below is really nice (in spite of the copyright cross-hatching). The multi-part kit is akin to 54mm models; he even sculpted separate pieces for the reins. The base for the horse is another work of art; it includes what appears to be articles from a fallen Roman. Boy, between the Roman guy in the Aventine elephant's trunk and these debris, the Romans don't seem to have any friends. Just kidding! 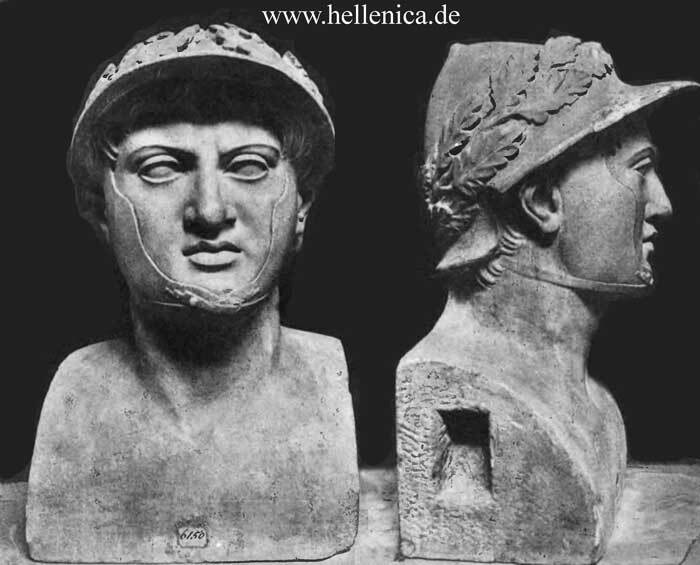 It's hard to make out in the photos (I'll take better ones once painted), but the head of Pyrrhus is probably the best likeness of that famous bust that I've seen in any scale. He even added Pyrrhus' wavy hair peaking out from the front of the helmet. Great work, Mike! According to Mike, he used Ebob horse bodies, but sculpts his own heads for them. 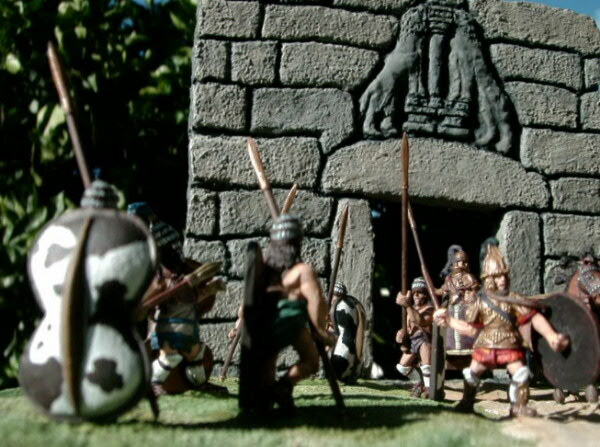 This figure is a true 28mm figure - it is not in the special "heroic" size like he did the Antiochus Megas figure. With the new Labors of the Gods rule set, figured it was time to start on some Mycenaean terrain that has been on the back burner for awhile. 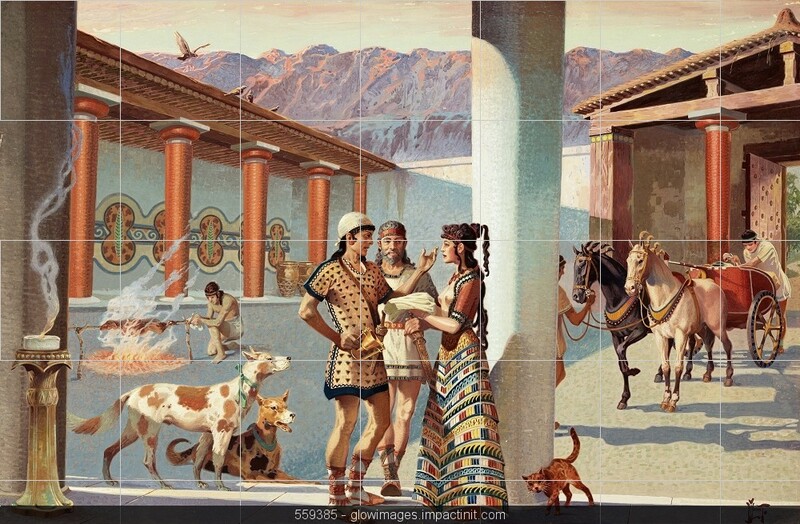 First up is a set of walls based on the megaron at Pylos. Several years ago I found a set of line drawings of these walls on the internet and printed them out. The drawings were then scaled for 28mm and printed out; sitting in a folder until now. So far, only finished the main wall with the throne; actually a carved stone chair. This will be fashioned out of Green Stuff - I hope. Here's a photo of the finished wall with some Redoubt and Foundry figures. The colors look a bit too bright; I may muted it by adding "smoke" residue from the hearth that was in the center of the room. The printed images of the line drawings were glued to foam core and cut out. As you can see, I pretty much painted the drawings like a coloring book; trying to stay within the lines. 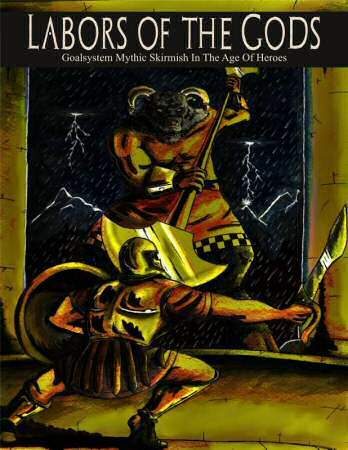 "Form a warband and adventure through Bronze Age Greece in a world where living myths walk among men! 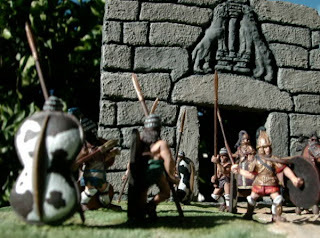 Build Demi-Gods, Satyrs, Centaurs, Amazons, and more! Battle your opponents' warband and the cursed children of the fallen Titans to recover ancient knowledge and gain the favor of the Gods themselves! Featuring skirmish-level action designed for 15mm or 28mm miniatures from any manufacturer, Labors of the Gods utilizes the tried and tested Goalsystem game engine made popular in previous releases like SuperSystem, Chaos in Carpathia, and Chaos in Cairo. Labors requires only a handful of miniatures and fistful of six-sided dice to play, and includes a full campaign system and five pre-made scenarios to get players right into the action. Clash with titanic foes and undertake legendary journeys on the tabletop with Labors of the Gods!" I plan to use the rules to host a game at one of this summer's Truants Friday gatherings.